In my time doing BizDev here at Bold Digital, 68% of my initial outreach includes telling startups that their blogs are great, but are missing or misusing one critical piece: a strong, persuasive, relevant CTA. Speaking to a lot of these startups on the phone, there seems to be an understanding that blogs will help with SEO, generating traffic, and overall brand awareness. That’s 100% true, but what they don’t realize is that their blogs also have the intrinsic ability to turn readers into valuable leads. Using a Call-to-Action (or CTA), they can create great leads right from their blog, but if not done correctly, these CTAs can have low conversion rates by missing out on some key elements. 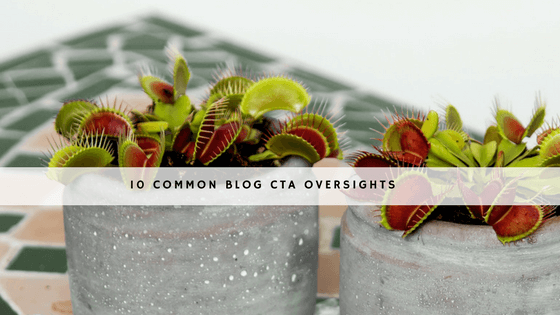 To be sure your CTAs are up to par, here are the 10 CTA mistakes you could be making on your blog and how to ensure you’ve got them set up for success. Not using any CTAs on your blog right now? It's time to get started, but make sure you're not fall into these common pitfalls. CTAs for the wrong buyer persona. For those of you creating content that are specific to your different buyer personas, first of all, that’s awesome! Creating content for specific kinds of people you’re looking to attract helps you build that priceless ‘they just get me’ feeling. Be sure that’s also seen in your CTAs. If a given blog post is written with a “Joe CEO” persona in mind, be sure to not offer an eBook written for your “Developer Dave” persona as a CTA. These different personas have unique interests and pains, and therefore should be offered ‘next step’ content at the end of each blog post that suits who they are as an individual. CTAs unrelated to the article’s pain point topic. Imagine you’ve just finished writing a blog post on employee productivity and you know you need a CTA at the bottom. You’re also just finished a report on email marketing, so you decide to make that the CTA so you can start getting a feel of how well it converts. The problem is your report is unrelated to pain point discussed in the post, and therefore will seems pretty left field to your reader. Remember that CTAs are your way to offer a deeper look into a topic that your blog post reader just learned about. If the topic of the post and the CTA are night and day, it’s fair to assume it will have a low conversion rate. Match the CTA to the post, and watch your conversation rate skyrocket. CTAs disregarding the reader’s buyer’s journey stage. This is probably the biggest culprit of them all. I’ve seen way too many B2B blogs that are pretty much autoset to end in “request a demo”, “start your free 14-day trial”, or “schedule a free consultation”. The problem with this is that you’re not respecting the buyer’s journey, which is sort of the reason you’re blogging in the first place. Unlike advertising that sells too soon instead of honoring where the reader is on their path to purchase, blogs are meant to respect that journey. Take the screenshot below for example. This is a company that offered a blog post relevant for readers at the top-of-the-funnel, who aren’t ready to be sold to. Nevertheless, they offered a free trial CTA, in attempts to expedit the buyer’s journey. A big no-no. By adding these bottom-of-the-funnel CTAs, you send a strong message to your readers that you’d rather sell than add value; a poor recipe for any relationship building strategy. CTAs for past webinars. Live/ time sensitive offers provide a novelty effect, creating an incredible sense of relevancy to your content. If you want to offer an upcoming webinar as a blog post CTA, be sure to record the event so that after the event is over you can change the CTA and landing page to offer readers the recording. As marketers, it’s important for us to keep to promises we make with our prospects in order to establish trust. If you say clicking on a CTA will lead to a webinar that already happened, and you don’t offer a way for them to access it, you’re about to lose some serious brownie points for that let down. “About us”/ “Contact us” CTAs. Similar to #3, by ending blog posts in these two catchphrases, you’ll be turning an adding value experience into an ‘all about me’ experience (see image below). Customer centric marketing is your goal, so make sure you’re not trying to push them down the marketing funnel faster than they’ll willing to go. Unpersuasive CTAs. Some of the most heartbreaking CTAs for me to see are the ones that are perfect (right persona, right pain point, right buyer’s journey stage) BUT the CTA’s just an embedded link in the last line of the blog post (see the screenshot below). If your reader can scroll over it, it’s time to build a stronger CTA. Want to make sure your CTAs are persuasive enough? Check out our blog post on how to create attention grabbing, persuasive CTAs. Asking for feedback CTAs. “Do you agree that X is important in 2018? We’d love to hear your feedback into the comments section below!”. Engagement is the big buzzword these days and comment sections can be a great way to allow people to express their appreciation or challenges and start a conversation. Having this as your sole CTA though is asking for value instead of giving it (Check out an example of this below). It helps to stick to the mantra, “always be helping”. If you’re planning on encouraging people to comment, that’s great! Just make sure you’re also adding an offer CTA so you can add value too. “Subscribe to our blog” CTAs. Blogging rule of thumb: Always offer people the option to subscribe to your blog. Blog subscriptions are a great way to feed readers your monthly digest of new articles, keep them in the loop of new products or services, and nurture brand awareness. Similar to #7 though, using Subscribe CTAs for you blog posts without an additional offer hits three substantial problems (as shown below). First, with blog subscriptions, it’s hard to get away with asking for more than an email address (which could be their personal email) and first name. Second, it gives you no context to their persona, buyer’s journey stage, or pain. Lastly, it doesn’t offer them any immediate value. Instead, be sure to include content offer CTAs that uncover these points, and can help you create a more tailored lead nurturing experience for your prospect. Pro tip: Use a lightbox like Leadin to capture potential subscribers before they leave your blog or website when they show exit intent or other redefined rules. Read the full article on X website. As a startup, there’s nothing more exciting that getting featured in an online publication or blog. Many times when this happen though, companies will practically cut-and-paste the article and publish it as their own post with a ‘Read the full article here” CTA (see below). While celebrating a name drop is an incredible way to position, Google hates copycats and it can greatly hurt your SEO efforts. Instead, write your own piece announcing the feature and create an in-text link to the original piece. Since it’s a positioning post, create a bottom-of-the-funnel CTA like a demo or free consult to turn interest into actionable behavior. (Pro SEO tip: make sure the article you’re featured in is linking back to your website. Otherwise, it’s a huge missed opportunity to leverage it for future visitors and leads.) Want to see what this looks like in action? Check out this post discussing our interview with The Telegraph UK. Multiple CTAs. Sometimes companies will offer more than one CTA in hopes that one will speak to the reader. Think again! By offer more than one CTA, you can actually overdo it and confuse the reader to the point that they won’t choose either! So be sure you pick one CTA that meets all the criteria above to ensure you’re setting yourself up for the best conversion rate. In short, less is more. If a company blog is the front door to the website to attract the right traffic, CTAs are the welcome mat that invites them in as a lead, contact, and friend. 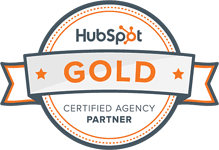 Without strong, relevant CTAs, who knows who you’ve missed out on? Be sure that your readers aren’t leaving without a trace before you’ve offered that added value and converted them into a lead using a CTA.